What you might not know about one of nature's oldest and most extraordinary events. The annual migration of wildebeest from the plains of the Serengeti in Tanzania to the grasslands in Masai Mara, Kenya is perhaps one of the greatest natural phenomena to be witnessed. Not only is it the world’s largest concentrated movement of wildlife, but also the longest in distance; the wildebeest travel over 1,800 miles on their on their 9 month journey. 1.The Great Migration isn’t a singular event—it’s a yearlong cycle, a voyage driven mainly by food and water availability. In November-December herds arrive on the plains of the Serengeti, where they’ll remain through March, feeding on fresh vegetation. Slowly the masses being moving west across the grasslands and begin their migration North around April. May through August the herds continue traveling northward, occasionally being stalled at certain crossings. Around mid-August- September the wildebeest face their greatest obstacle: The Mara River Crossing, a truly fascinating spectacle. By October, they are reversing their journey, following the rains Southward, with more grace to reach the Southern Serengeti once again. 2.Wildebeest are not the only participants of this cyclical journey—the approximate 1.5million migrating wildebeest are joined by hundreds of thousands of zebras, along with gazelles and antelope. 3. Zebras and wildebeest have forged a natural friendship, their relationship being symbiotic and for this reason they never part ways. 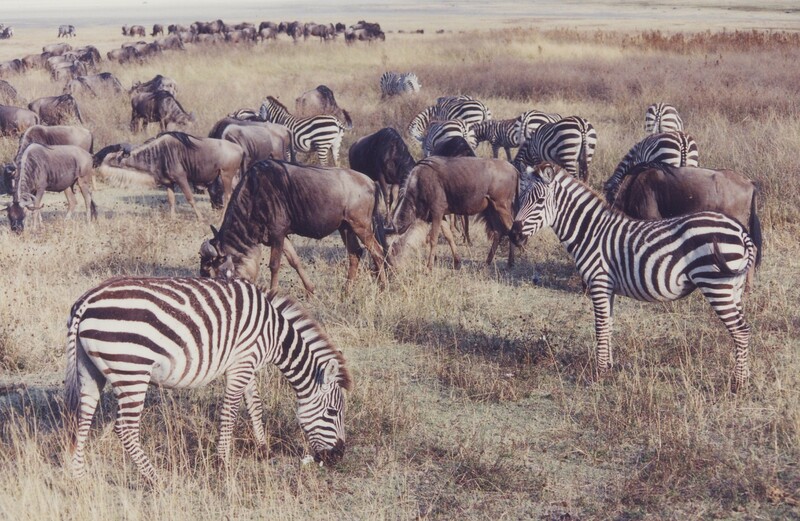 Although they feed off the same type of plant, the zebra and wildebeest actually eat different parts of the plant allowing them to graze amicably. The zebra also take on the role of protector and navigator—they keep the herd on course and also remain on the lookout for predators. In exchange, wildebeest help the zebra (and themselves) find water. The animal is known for its keen ability to sniff out water and so, the pack is able to find water nearly every day of the journey. 4. The period between January-March is when wildebeest birth their young. During this time, half a million wildebeest are born (yearly). In the month of February the birth rate is about 8,000 calves per day. 5. The Serengeti ecosystem is one of the oldest on the planet. The vegetation, climate and fauna have remained unchanged for over one million years. 6. To explain the wildebeest’s odd appearance, ancient African legend holds that God created the wildebeest using leftover spare parts. 7. As an observer, the migration may appear chaotic and disorganized (especially at the river crossing), however, researchers have found wildebeest’s operate using ‘swarm intelligence,’ which basically means they explore obstacles and generate solutions as one. 8. There are about 3,000 lions within the Serengeti that follow (and prey upon) the migrating herds. 9. Wildebeest are a noisy lot. They emit a constant, low moaning sound and when agitated or disturbed will snort violently. 10. Wildebeest are one of the only African antelope species to increase in population size; in 1960 there were an estimated 250,000 wildebeest and today there are over 1.5 million.